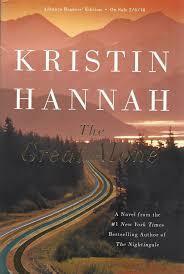 #1 New York Times Bestselling Author Kristin Hannah, whose new novel is The Great Alone (Macmillan). This week’s Write the Book Prompt was generously offered by my guest, Kristin Hannah. She says her favorite trick for herself is to simply write the description of place until her characters have something to say. For example, she’ll sit and start to describe Alaska. Perhaps it will take two pages of description before she realizes what it is she has to say in that scene, and then she’s off and running.